Realm are gearing up for a race to raise funds for Forever Manchester Week. 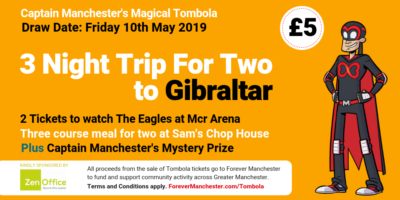 As part of the week of manc-style fundraising to celebrate and support community activity across Greater Manchester, Forever Manchester Ambassador and Realm Director, Duane Cormell, has decided to pit his colleagues against one another in a fundraising race. The Realm team will be set a financial target, with each member of staff also having an individual target to work towards. As soon as the race begins, each member of the Realm team will have to fundraise manc-style, whether that be by selling home-made Eccles cakes or getting sponsorship for dressing like Liam Gallagher for the week. If the team as a whole hit their target then the reward will be an afternoon off work to watch the much anticipated England Vs Wales Euro 2016 game down the pub, whilst the person that hits their individual target first can head off to watch the game safe in the knowledge that they will also be allowed to take the Friday off work too in order to nurse their inevitable hangover! The race will begin with the Realm team will being given their targets on the 10th June, with the finish line falling at 5:30pm on 15th June. Do show them your support for this monumental effort and let’s get them to that finish line!